The Reason You Would Want To Flip Your Drawing In Photoshop? You may have been watching some artist on Youtube creating an artwork in Photoshop, and you may have noticed they tend to flip the drawing back & forth every now and then. If you’re wondering why they do that, flipping the whole canvas can make it much easier to spot many kinds of drawing mistakes, like proportions mistakes. 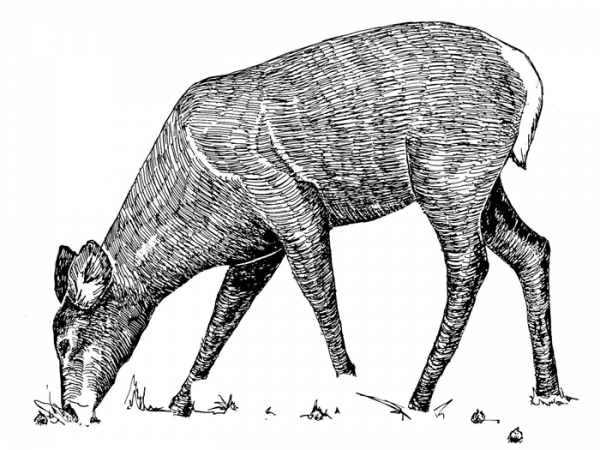 Which is why it’s listed among my tips for Tips & tricks for drawing proportions rights post. 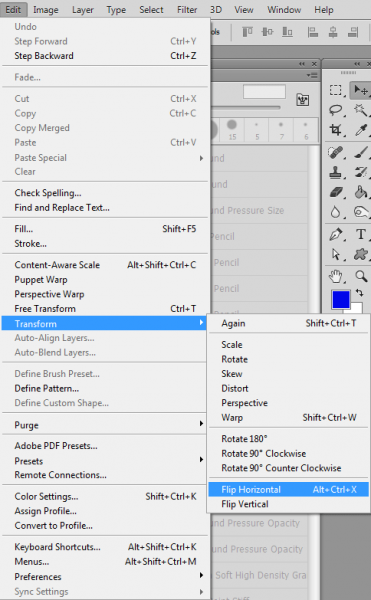 In this post, I will teach you how to do that in Photoshop (this feature exist in probably all drawing programs, so if you don’t use Photoshop, you can still flip your canvas). Since Photoshop gives you many options for flipping your drawings and parts of it, I will cover how to flip the whole canvas, as well as how to flip just the layers you’re working on. Flipping the whole canvas flips all the layers in the picture, including the background layer. The result will be the same whether you have one layer or more. This kind of flipping is what you need to apply if you want to check out mistakes in your whole drawing. You can repeat these steps again to get your drawing the way it was before. 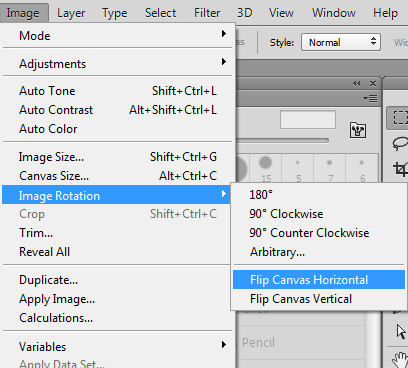 Note:- You probably noticed the Flip Canvas Vertical Option besides the “Flip Canvas Horizontal” options, this option does the same, except that it flips the canvas horizontally. You may be working on an artwork with multiple layers, and you happened to want to flip only the current layer you’re working on. 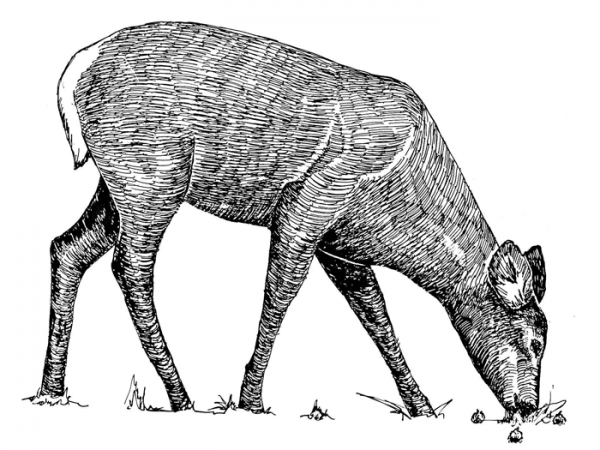 Either to check out any drawing mistakes you made in it, or to use it in a different way. 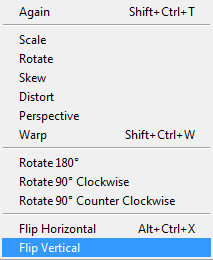 The way to do that is simple, all you have to do is Edit > Transform > Flip Horizontal from the main menu. Tip:- This technique can also be used to flip multiple layers as well. All you have to do it is to select multiple layers by holding down the CTRL key (command in Mac), and click on the layers you want to select one after the other, then repeat the steps above to rotate your layer(s). Tips:- Just like we could flip the whole canvas both horizontally & vertically. You can also flip layer(s) the same way, as there’s also an option to flip layer(s) vertically as well. Flipping the whole canvas, as well as one or more layer in it, can be a good way of spotting any drawing mistakes. It can also be used in design projects in many ways as well. The ability to flip many layers, both vertically & horizontally, is also nice if the object you’re drawing consist of many parts.